4mm Corrugated Plastic die cut sheets. Pre cut for your signs or applications. Different styles of shaped corrugated plastic sheets to choose from. 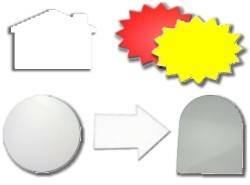 Available as: house, arrow, apple, star, star burst, circle, diamond & stop signs. Different sizes are available for most shapes..
Waterproof, tear proof, resistance to most chemicals. Light weight yet very strong. Works with our Step Stakes for outside uses. Sold in cases of 10 sheets. Contact Us for bulk orders & other shapes. Coroplast Die cut Corrugated Plastic sheets come in the following pre cut shapes; Apple, Star, House, Arrow, Star Burst, Stop Sign, Circle & Diamond. Different sizes and colors, red, white & yellow are available. Each sheet is pre-cut from a 4mm corrugated plastic sheet and are sold in cases of 10 sheets. Boards can be cleaned with soap and water and most solvents without affecting the sheet properties or appearance, board is resistant to dings and punctures. The coroplast die-cut corrugated plastic shapes, is recommended for real estate signs, Displays, Trade show, crafts, schools, festivals, booths, construction, temporary walls, building construction, decorations movie / TV sets, play houses, etc.. The perfect cut sheet for realtors, sign makers, and printers made from Corrugated Polypropolyene.